This map of the surface of Saturn's moon Mimas illustrates the regions that were imaged by Cassini during the spacecraft's flyby of the moon on Aug. 2, 2005. At closest approach, the spacecraft passed within approximately 62,900 kilometers (39,300 miles) above the moon's surface. Mimas is 398 kilometers (247 miles) across. 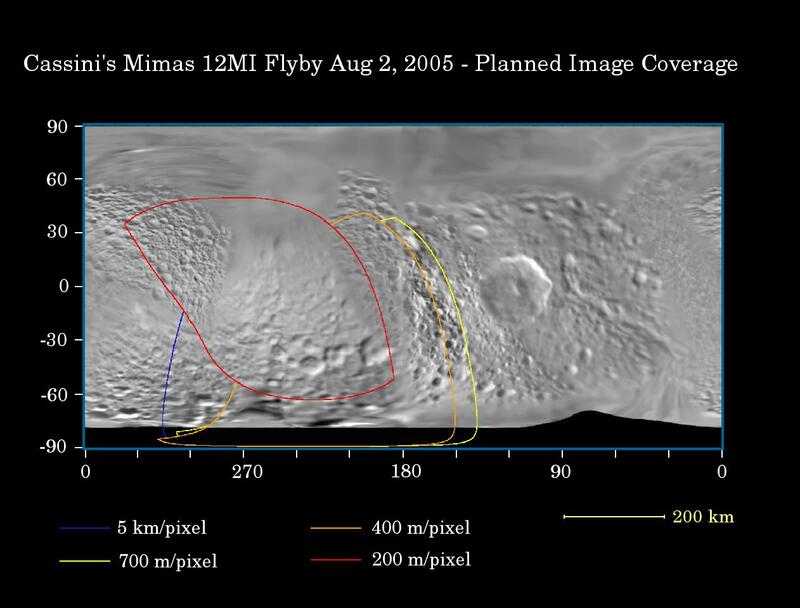 The flyby provided the best views yet of the south pole of Mimas and some of its northern latitudes, as well as distant views of the giant crater Hershel, near the terminator (the boundary between day and night). The highest resolution images show the trailing hemisphere of Mimas, opposite Herschel. Several fracture systems have been seen in the region in NASA Voyager images, like Pelion Chasma and Tintagil Chasma. Images obtained from this Cassini encounter may help test whether these canyons, and others on Mimas' surface, are related to the formation of Herschel. Craters seen on this pass are named after prominent characters in the King Arthur legend: Arthur, Merlin, Uther, Modred and Morgan.